Dunlop is confirmed as a tyre partner of Mercedes-AMG at the long-distance VLN races on the legendary Nürburgring-Nordschleife. Dunlop will be racing for the first time with the Mercedes-AMG GT3 in the VLN-long-distance championship (opening: Saturday, 25 March) and the 24-hour Nürburgring (25 – 28 May). The AMG performance teams Black Falcon and HTP Motorsport will use Dunlop racing tires in these demanding races. Dunlop and Mercedes-AMG have already collaborated successfully on the Nordschleife. Team Black Falcon won the 24-hour race at the Nürburgring in 2013 with a Dunlop equipped Mercedes-Benz SLS AMG GT3 – the first ever win for Mercedes in the 24 hours. “After a successful Nordschleife season 2016, we are intensifying our cooperation with Mercedes-AMG this year”, says Alexander Kühn, Motorsport Product Manager, EMEA Last year, Dunlop and Bonk Motorsport won the VLN long-distance championship in the Dunlop-shod BMW M235i. At the same time, the excellent performance of the Dunlop racing tires in the GT3 class led to some sensational results in 2016. The Audi R8 LMS from Phoenix Racing started with two victories and the Alzen-Ford GT marked a new VLN round record. Equipped with a standard GT3 tire, the new record was set at 7: 58.558 minutes. This season, Phoenix Racing and Dunlop continue their successful partnership. The team from the Eifel Region , close to the Nürburgring, has signed the highly rated driver quartet Frank Stippler, DTM driver Mike Rockenfeller, Dennis Busch and Nicolaj Møller Madsen. The Audi R8 LMS from the Car Collection team also contests the races on the Nordschleife on Dunlop. The team ‘Walkenhorst Motorsport powered by Dunlop’ is reintroducing two BMW M6 GT3s on the world’s toughest race track. As before, fans were once again able to choose a race design for the Dunlop Art Car before the start of the motor sport season. More than 77,000 motor sport fans took part this time. There were three designs created by the TV star and artist Jean Pierre Kraemer. The vote was clear: the design proposal “Crystal Flake” received a clear majority with more than 44,000 votes. 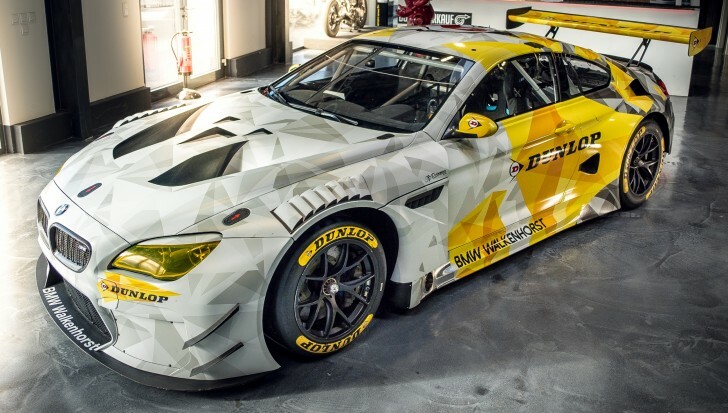 The premiere of the “Dunlop BMW M6 GT3 Art Car” will be at the first VLN race (Saturday 25 March). Dunlop is again the tire partner of Scuderia Cameron Glickenhaus. The American James Glickenhaus relies on Dunlop for the two SCG003C bespoke sports cars, which are visually and technically similar to a Le Mans prototype. Dunlop is also the choice among numerous privateers who fight for the class victories on the Nürburgring-Nordschleife. Dunlop continues to be the technical partner of BMW Motorsport and thus the exclusive tire partner of the BMW M235i Racing Cup. Additionally, all the Opel Astra Cup vehicles, which start on the Nordschleife in the Cup-1 class, are exclusively on Dunlop racing tires – as are the participants of the “DMV GT and Touring Car Cup” (DMV GTC), DMSB Touring Car -Cup (DTC Procar) and Dunlop-FHR-Cup.